Successfully Added Underwater Fish Finder Video Camera - 1/3 Inch CMOS, 4.3 Inch Screen, 15M Cable, 960x240 Resolution to your Shopping Cart. Make sure you don’t come home empty-handed after a fishing trip or study what lies beneath the waves with this mini and super portable fishing camera. Peek beneath the waters and see where all the fish are hiding. Study the underwater world and learn about marine life and their habits or survey underwater structures – all with one simple inexpensive gadget. Know where to fish and what bait to use with this mini portable fishing camera. Simply let it sit above your lure and see what’s happening underwater near your fishing line – live. Having that information will not only let you choose richer fishing spots, but also let you know what catch to expect or what bait to use – depending on the type of fish lurking underwater. The cam comes with a 120 degree wide angle lens and will give you a full view of the underwater area. You can conveniently view it on the 4.3 inch LCD display with the 960x240 resolution. Having an underwater fishing cam can also help you learn more about the fishing area and the behavior of the type of fish that you are interested in. Watch which kind of bait works and which not, learn which times are better for setting up your fishing line and discover hidden spots that can guarantee a great catch. Not into fishing? The underwater camera comes with lots of other application. It’s a great tool for studying marine life, learning about the neighboring bodies of water, scouting dive sites or looking for pirate ship wreckage and hidden treasure. The cam comes with a 15M cable and 8 LED lights that will light your way even in the darkest waters. The 2600mAh battery will offer up to 6 hours of usage time. 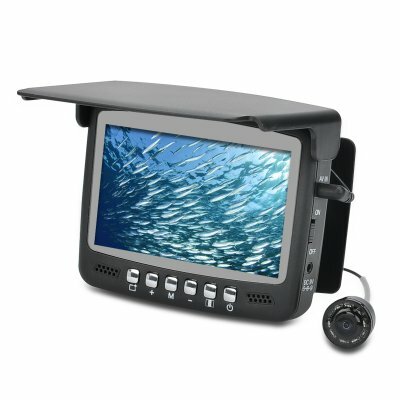 The Underwater Fish Finder Camera comes with a 12 months warranty, brought to you by the leader in electronic devices as well as wholesale underwater fishing cameras..